I can't believe how wrong I was in my misgivings. 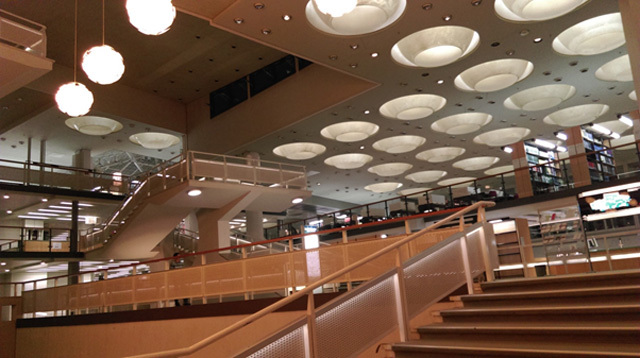 This past January I turned to the Staatsbibliothek, also known as the Stabi, because I had nowhere else to go. What was my conundrum? I was a post-grad (meaning, no longer a master’s student) in need of extensive online research databases. My choices were to pay 30 Euros for a single article or pay 30 Euros for a yearlong library membership, with which I could get countless articles "for free." Hmmmmm. While a part of me was feeling a bit snobbish, thinking "Well! 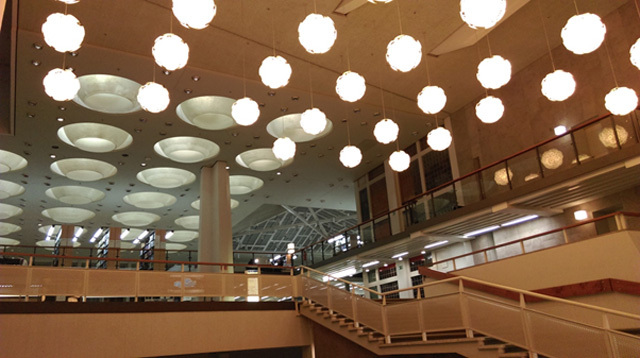 In the United States one usually doesn't have to PAY to access the library," but seriously, upon taking my first steps into this different world called Staatsbibliothek zu Berlin, I relinquished my judgments entirely. Those 30 Euros have been without a doubt the best 30 Euros I have spent this past year. Yes, the full past 365 days. Picture from the main staircase into the library. Note the various types of lights. This lighting design produces a calm yet mentally stimulating visual effect. I got my card, passed through the slightly awkward check-in desk – you have to put your belongings in a plastic bag, walk through one of two narrow walkways with turnstiles and show attendants that you don’t have anything suspicious – and took my first steps into what felt like another world. The air was different. The gravitational pull had decreased. I felt lighter; my movements and thoughts heightened to a more fluid yet focused state. Other people were there.... but.... not. An exceptional cough pulled me shortly back into reality: that this space was not a creation of my own imagination. What was it that made this building so special? Yes, its international library collection is vast - it's what brought me here - but what keeps me here and entrances me has only partly to do with the books numbering the seemingly infinite shelves. For me, it was the architecture, the use of light and space. The buildings that caused me concern and discomfort four years ago were inspiring creativity and delightful productivity in me today. My relief in finally finding such a place gave me cause to celebrate it and share it in some way: I decided to pop into people’s bubbles and hear in their own words what this library means to them. This past Saturday I visited the library for this purpose, which also happened to be the day a dance performance was taking place… in the sacredly silent library… whaaaaat? Score! So, before the dance show, I sat in the library’s café and “quatsched” a bit with a few fellow library frequenters. As chance would have it, the first person I spoke with studied LIBRARY ARCHITECTURE!! Fate anyone??? Crazy. Here is Thomaso, a very charming, kind gentleman from Italy. I asked him about his experience in the library and what brought him here. 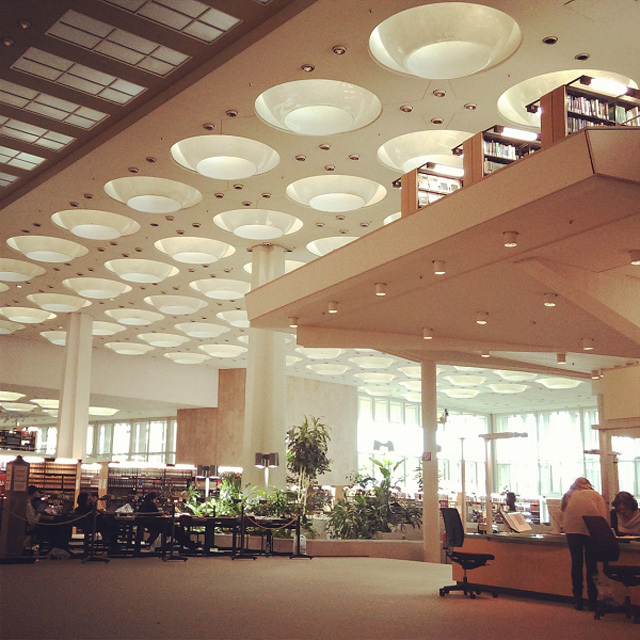 Some of the many levels in the library. The open architecture is very beautiful… I like spending time in the reading hall, with the various levels and the big, open room. I like that a lot. I asked her what she finds particularly pleasant about the atmosphere here. 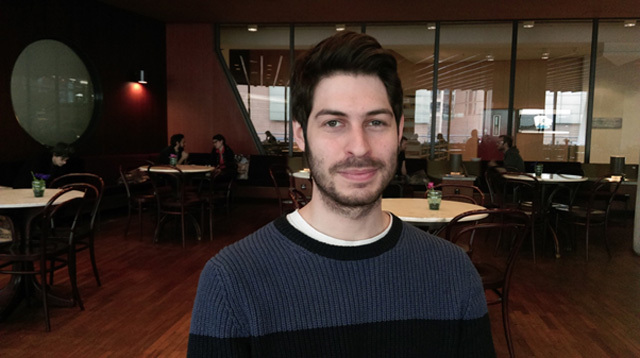 “[the library patrons are] very international, which I think is good. They might come for a particular manuscript or collection,” which fits the profile of both Thomaso and me. That’s exactly what brought us here. He first wrote his diploma at the Stabi 25 years ago and has only come back as a frequent visitor six months ago. Twenty years ago it used to be very full. It would be difficult to find a spot to sit. A few things have changed since then. 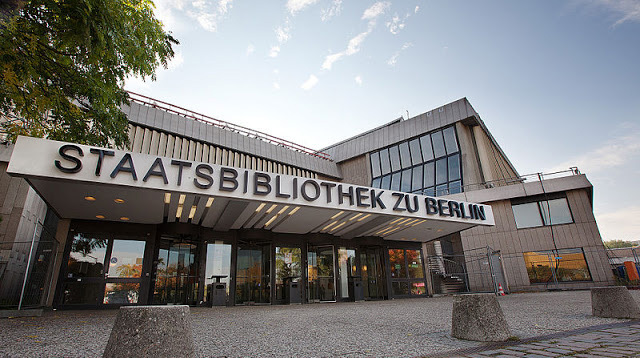 He informed me that before it was free to become a member, and on top of that, more large libraries have been built in Berlin, so some people visit those libraries instead. And of course, many people have access to the internet at home and just about anywhere else, which reduces their reliance on libraries to obtain information. I asked him what he enjoys most about this library. “The people here are very friendly and intellectual.” I can see where he’s coming from: all of the people I have ever interacted with here have only been super kind and open. Interactions like that make any day 100 times brighter. One last person, I spoke with before going to the dance performance was a young woman named Sarah. When I asked her if she could sum up the library’s atmosphere in one word or phrase she responded with, “anonymous community,” which I think is genius and right on the nose! The other [patrons] are doing similar things, but it’s not necessary that we get together and share what we are doing; it feels nice. While I could have gathered stories and perspectives until closing, it had come time for the dance performance “Free Your Mind! 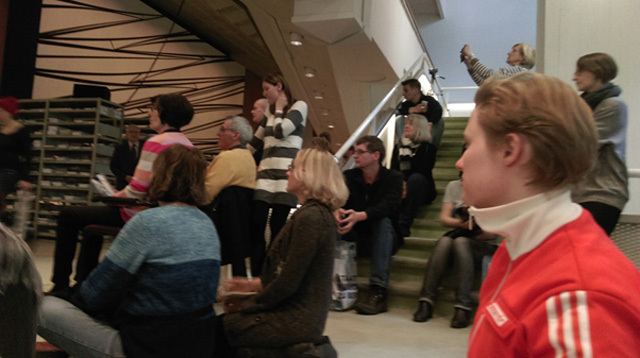 Tanz!” I gave my thanks, left the café and gathered with my fabulous “anonymous community,” sitting together on the floor kindergarten style, in the middle of one of the library’s large, open halls. It felt so funny to hear rap music blaring, dancers speaking into the microphone and rolling and jumping through space, us patrons sending a roaring applause through the library – twice – but I most certainly delighted in every second of it! If you didn’t get the message yet, I strongly recommend making this library a part of your life and ticking it off your architectural bucket list. 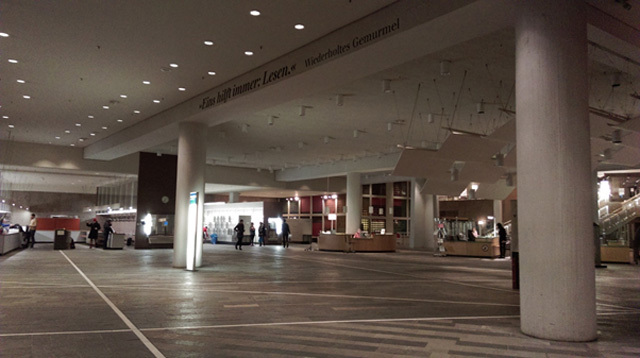 And after you spend a nice, long productive day here, you can step out into the night and walk next door to enjoy yet another of Berlin’s architectural feats: The Sony Center. 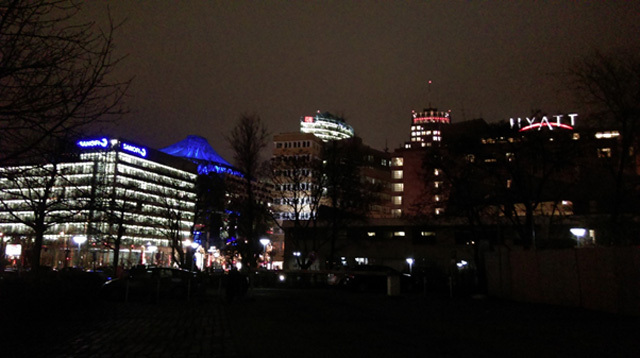 View at the entrance of the library, with the Sony Center emanating blue light into the night.